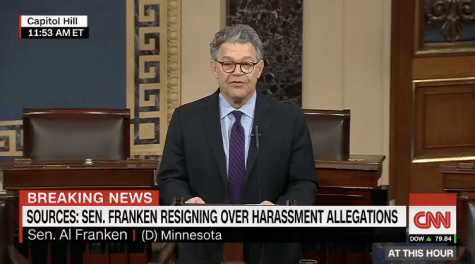 A day after 32 of his Democratic colleagues in the Senate called for him to resign amid multiple sexual harassment claims, Al Franken announced on Thursday that he will step down in the coming weeks. “In the coming weeks, I will be resigning as a member of the United States Senate,” said the Minnesota senator. His announcement comes after eight women came forward accusing Franken of either groping them or forcibly trying to kiss them. In a bold statement, Franken said that he knows he did “nothing” to bring “dishonor” to the Senate. He brought up sexual misconduct claims against President Trump and called for Alabama Senate candidate Roy Moore to step aside, saying it’s ironic that he is leaving Washington at this time. Franken noted that although he is leaving the Senate, he will not be leaving politics altogether.